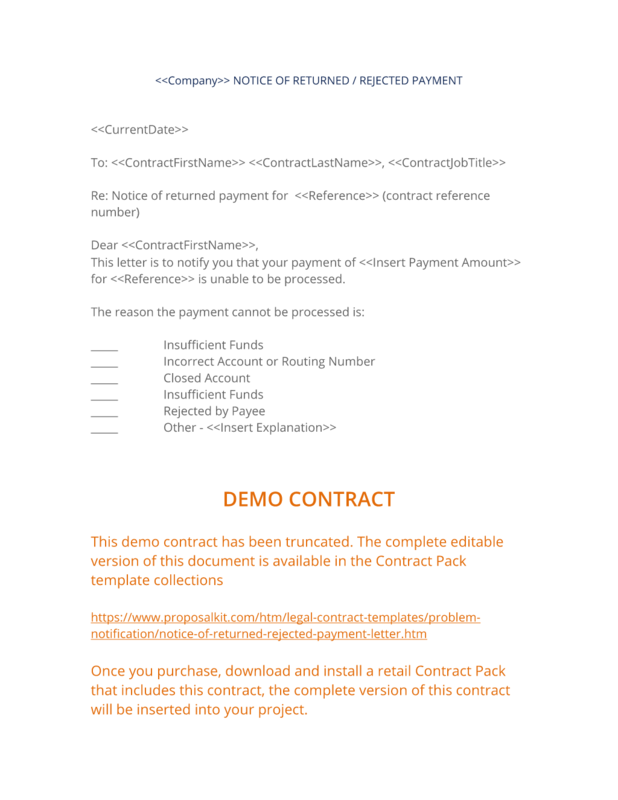 You can create your own customized editable version of this contract document using Advertising/Marketing Contract Pack. Follow these steps to get started. legal business documents very well. You can produce any types of document with the software once you learn to integrate all subject matters into one document. I have searched for a long time to find this type of business document all in one place." 1. Get Advertising/Marketing Contract Pack that includes this business contract document. This Notice of Rejected Payment Letter is included in editable Word format that can be customized in Word or by using the included Wizard software. Once you have ordered and downloaded your Advertising/Marketing Contract Pack you will have all the content you need to get started with your own formal declaration. How do you write a Notice of Rejected Payment Letter document? To: First Last, Contract Job Title. Re: Notice of returned payment for Contract Reference Number (contract reference number). This letter is to notify you that your payment of Payment Amount for Contract Reference Number is unable to be processed. Please contact us as soon as possible to arrange payment for your account. The complete Notice of Rejected Payment Letter - with the actual formatting and layout - is available in this Contract Pack.